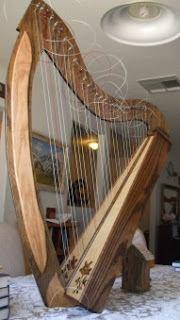 I won't tune the harp up until I get back from my writer's conference, but I can install the strings. This is always a moment of truth. If I've made an error in my design, it will show up now. I thread each string down through its hole in the string rib, then knot it underneath. 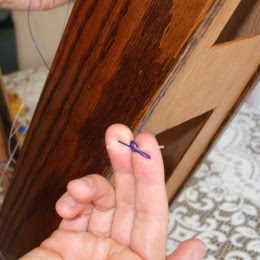 I use a basic slip knot tied so that the loose end is the tiny little short end of the string, the end on which there will be no tension. 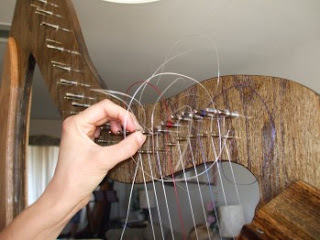 For the thinner strings I thread a piece of thick string into the knot to keep it from pulling through the sound board. Then I wind each string around the tuning pin three or four times and slip the long end down through the hole in the pin. I turn the pin a half turn so that the string holds in place, then go on to the next one. So far so good. The strings look parallel and evenly spaced. I'd like a little more change in angle when the strings go over the bridge pins, but it works. You are just plain awesome. By the way your "rodents" hate me. One of them dislikes me so much it hides under the wheel whenever I come in. I thought it must be dead, so I reached in there to check and it bit me. Stupid. I should know better, but after all I thought it was dead. Believe me - it's alive and has a wicked sense of humor. I am sure it's just as ticked at me reaching in as I am for it biting me so I offered some celery as a peace offering today. It pretended to be dead. That must be Darling you're talking about. I have a theory about her. I think she's a naughty princess who has been cursed and turned into a black hamster by her fairy godmother. That is the only way to explain her attitude. Home Again, Home Again, Jiggity Jigg!